Today is the third and final post on biblical church leadership. Monday, I looked at the first office of biblical church leadership in that of an elder. Wednesday, I looked at the second office of biblical church leadership in that of a deacon. Today, I will look at the third office or role in that of a church member, which is not a specific leadership role such as elder and deacon, but each member does have an important role to play within the body of Christ. Some people and churches are not sure about the idea of membership, but the concept of a "member" or "membership" is seen throughout the Bible. And just as we are members of our physical family by birth, we are to be members of our spiritual family through our second birth. A simple definition of a church member is one who loves Jesus, loves the church, and wants to share the love of Jesus with the world through the church. The church where I am a member has a mission statement similar to this: Love God, Love Each Other, Love Our World. The Bible speaks of church membership in relational terms as members of one body and members of the household of God - living in community (Rom. 12:4-5; 1 Cor. 12:12-27; Eph. 2:18-19; 3:6; 4:25; 5:29-30). WHAT DOES A CHURCH MEMBER DO? WHO CAN BE A CHURCH MEMBER? A baptized follower of Jesus. This point can be a bit controversial, but baptism is a first sign of obedience to Christ and the minimum requirement should be that one get baptized in becoming a member of the body. Most new church starts will not have a formal written out membership covenant, but it is something to consider as the church grows and matures. The other two biblical church leadership offices, elder and deacon, come from within the body or from the church members. Another important role within the church that is also from a member is a treasurer. Although the treasurer is not a specific laid out office it does follow the pattern and leadership of Jesus as he traveled with the disciples. Jesus was accused of many things, but he was never accused of mishandling money. Why? Because Jesus had a treasurer. WHAT ARE THE QUALIFICATIONS OF A MEMBER? There is no detailed list given, but one can assume similar qualifications to that of an elder and deacon. In some ways the qualifications given for elders and deacons are lists given for all believers to attain in character. Will these qualifications be evident overnight? No, that is part of the sanctification and discipleship process. As disciples are made and transformation takes place, more and more of these qualifications will become evident. So the responsibility and duty of a church member is the same of a Christian, but in the case of a church member, tied into with a local community of believers, the church. This post is adapted from a recent teaching on biblical church leadership conducted with a group of S. Asian church planters. Four main resources were used in preparation for this teaching: The ESV Study Bible, Danny Akin's A Theology for the Church, Mark Driscoll's Doctrine: What Every Christian Should Believe, and Nathan Shank's Four Fields of Kingdom Growth. Monday, I took some time to start looking at biblical church leadership and I started with the first office of an elder. Today, I will look at the second office of biblical church leadership, deacons. I will look at the office itself, what deacons do, who is qualified to be a deacon, and how it is that they work together with the elders for the good of the church. Greek word for deacon, "Diakonos", simply means servant. In Acts 6:1-7, we see deacons as the ones appointed to the position of leadership as a servant or offering service to the whole body. Mark Dever helpfully points out three areas of a deacons ministry. Acts 6:1 there is a disunity or complaint coming against the body, which the deacons are chosen to serve in this area of keeping unity. WHO IS QUALIFIED TO BE A DEACON? Qualified, godly men and women can be deacons. The list of qualifications for deacons can be found in 1 Timothy 3:8-13 and the list is almost identical to the qualifications of an elder with two key exceptions. First, an elder must be able to teach and preach on some level, whereas a deacon is not required to have any teaching ability. Second, both this passage and Romans 16:1 point to the fact that women may also serve in the role of deacon, which is a clear distinction from that of an elder. Both the elders and the deacons have important roles in the church that they work together for the overall good of the church. 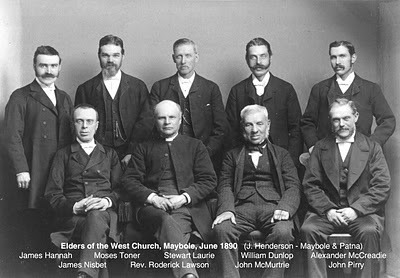 Godly male elders through their oversight of the church, including equipping the body and the teaching and preaching. Godly male and female deacons through the leadership in the works of a servant. This week I had the opportunity to teach a group of church planters on what Biblical Church Leadership looks like and many of you have asked about this teaching. The following is a modified form of my notes as we worked through this important issue together. My hope is that the teaching will help those like the church I grew up in move to a more biblical based form of leadership. Today, I will look at the role of an elder answering the questions who leads a church, what are the duties of an elder, and who is qualified to be an elder? First, and foremost Jesus leads the church, he is the "senior" pastor. The Bible does provide three roles of Christians in the church. Two of these are specific offices and the other is the general role of all believers within the church. All three should be found within a healthy church, but today we will look briefly at the first office, elders. In the New Testament all the above words are seen being used to describe the same office, in other words all of these words are used interchangeably. 1. Shepherd - Ephesians 4:11 - "Proimenos" - Literally the word here for shepherd translated pastor. 2. Elder: Titus 1:5-6 - "Presbuterous"
3. Overseer: Titus 1:7 - "Episkopon" - alternatively translated bishop. The Bible refers to this first office of service as the highest role found within a local church. This role is not given to one as a way to be a dictator over the church, but rather to be the ultimate servant within a church as is the example of Jesus in Matthew 20:25-28. WHAT ARE THE DUTIES OF AN ELDER? 1. Pastoral care, which includes equipping the body of believers for ministry (Acts 20:28,35; 1 Tim. 3:5; Heb. 13:17; Eph. 4:11-16). 2. Oversight of the churh, including guidance of the teaching and preaching (1 Tim. 4:14; 5:17; 2 Tim. 1:13-14; 2:2; Titus 1:9). WHO IS QUALIFIED TO BE AN ELDER? Only godly, qualified men can be elders. If one turns to 1 Timothy 3:1-7 and Titus 1:5-9, the list of qualifications of an elder are found. The two lists are generally the same with one pointing out not to make a new convert an elder in a local body. Mark Dever has also pointed out a helpful qualification from 1 Peter 5:2, which shows that one that aspires to the office of an elder be eager to serve. It is important to note that the Bible also usually refers to elders in the plural sense both in the Old and New Testament. Although it may not happen immediately in a new church start as I was teaching this group of church planters, but it is a good idea to eventually have more than one elder for many reasons. It is the normal practice in the Bible. It allows for unity in the body. It keeps the leaders accountable. It is also important to note that when studying the biblical qualifications of an elder there is very little emphasis put on gifting or education. Rather what is seen is the majority of the emphasis put on the character of the individual, godly character. Giftedness and education of course are not bad things, but they are not of ultimate importance when it comes to developing or appointing elders within a local church. I have experienced this quote in my own life with different people or groups time and time again. As long as I fit neatly or they think I fit neatly into their box then everything is okay and we can have a relationship, but as soon as I get outside of the box, which often happens, then I have suddenly disappointed them. For years these type of people would confuse me and I would feel down like it was my fault that our relationship changed, but one day I finally realized it is not me, it is them. I remember sharing a situation similar to this with the global church planting pastor at our sending church and I told him I assumed it was just my personality that rubbed some people the wrong way, which caused some conflict with others overseas. Him and his wife both turned to me and said, "Matt, do not believe that lie. You are not the problem, the way these people are treating you and your family is the problem." Hearing the truth from someone else caused a light bulb to go off in my head when I suddenly realized that what they were saying was true. If you have known me for any amount of time then you know that I do not easily fit into most peoples boxes, whether that be a denominational box, an organizational box, a group or club, etc. Yes, I am a part of many of those things and in some ways they do make up part of what I do, but I do not let one or any of them define who I am. I have come to a comfortable enough place in my own life to recognize that I have freedom in the Spirit and that I do not neatly fit a box, system, or program because I can only be me in Christ. One more example at the end of 2012 my wife and I had to make a very important decision that would affect the next few years of our lives. We delayed for quite some time as more and more pressure was put on to make a decision, which resulted in more delay because of my fear of disappointing them. We knew the decision had been made well before the actual time to voice it, but when we sensed the Lord moving us a different direction from what we knew this individual would want to hear we were afraid to disappoint them. There is probably a situation in your life right now that you are about to step outside of the box, but you are delaying for fear of disappointment. I have to agree with Lecrae on this one, don't be afraid to disappoint as long as you know that stepping outside of the box is the right thing to do. There are aways going to be haters and talkers wherever you go, but you need to realize that God has called you to do too many other things than to fear disappointing people that get in your way. Go ahead, get out of the box, disappoint, and move on! Is It All Just Fantasy? This is a post that originally appeared in August of 2010 on matthewboyd.net after recently returning from my first trip to India. After visiting a place like India, people are often horrified by the pictures of the many temples filled with idolatry worship. A common response would be, "I am thankful we live in a Christian nation, where we don't see idol worship or temples." First, that is a very United States mindset and far from the truth. Second, when are people, specifically those in the church, going to open their eyes and look around them at all of the idolatry taking place all over their city and in their own life. As most people are this time of year, I am anticipating the official start to football season. I watched a three hour pre-season game last night of my favorite team, the Carolina Panthers, signed up for a fantasy football league, and watched a special on the upcoming season this afternoon. None of those things are inherently wrong, but I did make some key observations, specifically during the special today that troubled me. First, I cannot get passed the new Dallas Cowboys stadium and not be reminded of the Hindu temples in India.They may look different, but just listening to the Cowboys organization describe their stadium, temple, in their own words, what it means and symbolizes to them, and how over the top it is. Second, I heard a player say, "I am giving my heart and soul to this organization." Now, I know you are thinking he probably didn't really mean that and there is a place for dedication and putting your heart into your work, but really, giving your heart and soul over to a football organization? Third, I heard another player say, "I worshiped this guy(referring to a veteran player) growing up." We all look up to people growing up, but admiring someone and worshipping them are vastly different. Well known pastor, Mark Driscoll, once had a Christian woman in India tell him she would never visit America again because of all of the idolatry in America: the stadiums looked like temples to her. Most of us hear that and laugh, but in part she is right, to many people that is their temple. Think for a minute about how many people every Sunday from now to the Super Bowl will pack into stadiums all over the country week after week to cheer on, or worship their team, and now compare that number with the amount of people in our churches every week being introduced to the only God who deserves worship. There is no comparison in the numbers. Let me clarify that I am not against football, stadiums, fantasy leagues, etc. in and of themselves, but when they become what we are worshipping in our lives I am. My above paragraph is also another reason that there needs to be more men stepping up to the role of church planter so our cities all over will be full of churches where people can hear the truth and have an opportunity to worship the Lord Jesus Christ. Now, I am excited and plan on enjoying this football season as I hope all of you do, but just think about who or what you worship and observe those in the culture around you as we are all designed to worship and we all worship someone or something daily. Leave the fantasy where it belongs and embrace the reality of truth. Tomorrow my boy, Hank Murphy, has a new full-length record releasing. The title of the album is "One," which Hank hopes will awaken people to a simplicity in their lives. If you are new to Hank Murphy I cannot encourage you enough to go get this album as I have deeply appreciated how he leads the church in worship through song. To learn more and order your copy now go to hankmurphymusic.com. Hank Murphy - "One" from Josh Sliffe on Vimeo. This week I had a two day training with group of church planters that I will be investing a lot of time in through the end of the year. This is a solid group of men that were trained broadly this summer and have proven faithful in making disciples as they work towards forming new churches. The first day of the training I spent some time doing pastoral care as these men opened their hearts to me in all that has happened to them over the past couple of months. There are many good things to rejoice over, such as over twenty new followers of Jesus that have been baptized and are now being discipled. There is at least one new church start and two more fellowships that are moving towards church. These guys are a solid group that have a vision of seeing their village, district, and state changed by the gospel through the planting of healthy reproducing churches that will hopefully spark a church planting movement. At the same time this group has faced many hardships and persecution along with spiritual warfare over these past couple of months. In my pastoral care I reminded them that we are at war and our enemy does not like what we are doing. We looked at Scripture together to remember that persecution is normal, although we never seek it, and that often times when persecution does come it is a sign that something great is about to happen as the church typically flourishes in an environment of persecution. Doing pastoral care to a group of church planters that have faced some of the situations they have faced is one of the more difficult things for me to do. I recognize up front and told them that I have never faced these forms of persecution and likely will not. One guy was threatened to leave the area he was sharing the gospel or the villagers would cut his head off. Two new believers have denied their faith: one due to the threat from his wife that she would poison him otherwise; the other women was threatened to be kicked out of her family, left homeless and jobless. Another guys wife is under constant verbal abuse from his parents as they live in a joint home. And the stories could continue as these are just a few examples that come to mind. 12 Beloved, do not be surprised at the fiery trial when it comes upon you to test you, as though something strange were happening to you. 13 But rejoice insofar as you share Christ's sufferings, that you may also rejoice and be glad when his glory is revealed. 14 If you are insulted for the name of Christ, you are blessed, because the Spirit of glory[a] and of God rests upon you. 15 But let none of you suffer as a murderer or a thief or an evildoer or as a meddler. 16 Yet if anyone suffers as a Christian, let him not be ashamed, but let him glorify God in that name. 17 For it is time for judgment to begin at the household of God; and if it begins with us, what will be the outcome for those who do not obey the gospel of God? 18 And “If the righteous is scarcely saved what will become of the ungodly and the sinner?”[b] 19 Therefore let those who suffer according to God's will entrust their souls to a faithful Creator while doing good. I share this with you to remind you that no matter where you live in the world you will likely at some point suffer for being a Christian. I also share this with you to ask if you are in Christ yourself that you would take some time this weekend to pray for this group of church planters that are facing much more difficult circumstances for their faith than you likely are. As I reminded them, we never seek this suffering, but we should rejoice when we do suffer for we know that we are sharing in the suffering of Christ and know that Christ is indeed worth it! Next week I officially start working on my second masters degree, an MA in Intercultural Studies. My reading list of recommended books for the fall will reflect my mandatory books and a couple of others that I have recommended before that I am also reading for a practical ministry assignment. As you will see from the list below, the main topic of study this coming semester is Spiritual Warfare. 3 Crucial Questions About Spiritual Warfare by Clinton Arnold. I just wanted to plug one of the newest church starts through the Summit Network, Hub Church Boston. Boston is one of the cities in the US with the most needs for new churches. Watch the video below of the lead planter/pastor Charlie Dunn and consider partnering with them through prayer, giving, or even joining their team. The new Matt Papa album "Look & Live" is about a month out from release, but watch the preview here now and go put in your pre-order. This week I read maybe one of the best modern books that I have read all summer, Everyday Church, and it wasn't even on my summer reading list. Before I go any further let me be clear in that I highly recommend this book and if you go to the link you may be able to still get it on kindle for $1.99. In one part of the book the authors, Steve Timmis and Tim Chester, take a look at how to live in a post-Christendom context. Below you will find very little commentary from me, but quotes and info directly from the book that sums up a lot of what I see the US going through as a society and the church in the US. Most of my observations have come from being afar, which has given me a different perspective, but based on conversations with people back home and keeping up with news outlets I believe what you will read below is on to something. The assumption is that Christianity should have a privileged status in the cultural and political discourse of the nation. Presidents and would-be presidents overtly reference their faith and close their speeches with the words, "God bless America." In his book After Christendom Stuart Murray defines post-Christendom as the culture that emerges as the Christian faith loses coherence within a society that has been definitively shaped by the Christian story and as the institutions that have been developed to express Christian convictions decline in influence. 1) From the center to margins. In Christendom the Christian story and the churches were central, but in a post-Christendom these are marginal. 2) From the majority to the minority. In Christendom Christians comprised the (often overwhelming) majority, but in the post-Christendom we are a minority. 3) From settlers to sojourners. In Christendom Christians felt at home in a culture shaped by their story, but in a post-Christendom we are aliens, exiles, and pilgrims in a culture where we no longer feel at home. 4) From privilege to plurality. In Christendom Christians enjoyed many privileges, but in post-Christendom we are one community among many in a plural society. 5) From control to witness. In Christendom churches could exert control over society, but in a post-Christendom we exercise influence only through witnessing our story and its implications. 6) From maintenance to mission. In Christendom the emphasis was on maintaining a supposedly Christian status quo, but in post-Christendom it is on mission within a contested environment. 7) From institution to movement. In Christendom churches operated mainly in institutional mode, but in post-Christendom we must become again a Christian movement. As disciples and those in Christ we are a chosen people that are to daily proclaim the excellencies of Christ Jesus to the world around us. This is not always an easy task and there are at times many barriers that get in the way of effectively doing this, but that does not get us off the hook. Rather as the church, those in Christ, we should do our best to remove any barriers to proclaiming the gospel to the world around us. Yes, the gospel and the cross of Christ is offensive and will remain offensive, but other non-essentials that we put up should be removed if they act as a barrier. In part this is what cross-cultural missionaries do when they practice good contextualization. For example, in the part of S. Asia where I live and serve if one eats beef it is considered offensive to most and would clearly be a barrier to the gospel. So, what do I do? I don't mention beef or eat beef in the context and setting unless appropriate. There is nothing wrong with eating beef and I believe that in Christ I have the freedom to do so, but if it is going to be a barrier to the gospel then I can do without. This should cause us to examine how we conduct ourselves, our families, and even our churches. Take a look at the way we live, how we do life, and how our churches operate and see if there is anything that is unnecessarily being a barrier to the gospel. This is one reason that I am all in favor of churches removing the name "Baptist" from the name of the church. Why? For starters there are many more churches than Baptists ones out there and two, in many contexts it does cause a barrier to the gospel being proclaimed. As disciples of Christ we should be bridge builders, therefore removing any barriers to the proclamation of the gospel and seeing lives changed. Are You Willing to Learn From Those Outside Your Tribe? As humans we are all part of a tribe or in some cases we are part of many tribes. This is never truer than for those in the evangelical circle, we all have our tribe. Sometimes this comes in the form of a denomination, a network, or a set of beliefs. And at times there is some overlap of tribes based on ones preferences, convictions, and beliefs. There is nothing wrong with being part of a tribe as it is human nature, but at times we so value our own tribe that we are unwilling to cooperate or learn from those outside of our own tribe. Unfortunately I have seen this first hand with certain tribes that I am actually a part of, although I am usually one of the "different" guys in the tribes I am part of as I tend to look outside the tribe in order to learn from others that are doing something different. I heard my pastor J.D. Greear say recently that "you will wither and die if you only learn from your own tribe." And yet, I witness this over and over again within some of my tribes. For the Reformed guys that are filling up places like Southern Seminary then everything has to be Reformed. If a guy is slightly off the Reformed radar then they cannot learn from him. For my Baptists guys we often come across as if "we have it all figured out," and act as if you either join us or get out of our way. Sadly, I have seen this on the mission field in many places too. The attitude that our tribe has established the best practices is good and well until we are unwilling to learn from others. So, are you willing to learn from those outside of your tribe? I have already mentioned that I am usually one of the different ones amongst a tribe in part for this reason. Venturing outside of my own tribe to learn from others has always been a way to build a bridge into partnership for me. Figure out what tribes you belong to and then find a couple of tribes that are different from you that maybe even make you uncomfortable and go spend some time with them, learn from them, and build some bridges.